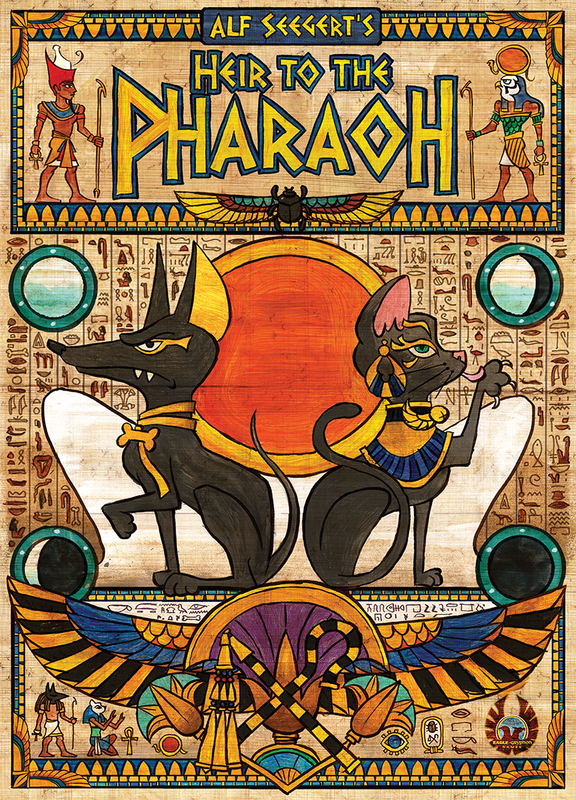 Heir to the Pharaoh is a two player game with many layers. It is a lush production (especially the Kickstarter version). It has great components and great art. Heir to the Pharaoh is a somewhat light abstract-ish game with a really cool and original bidding mechanism. What is Heir to the Pharaoh like? 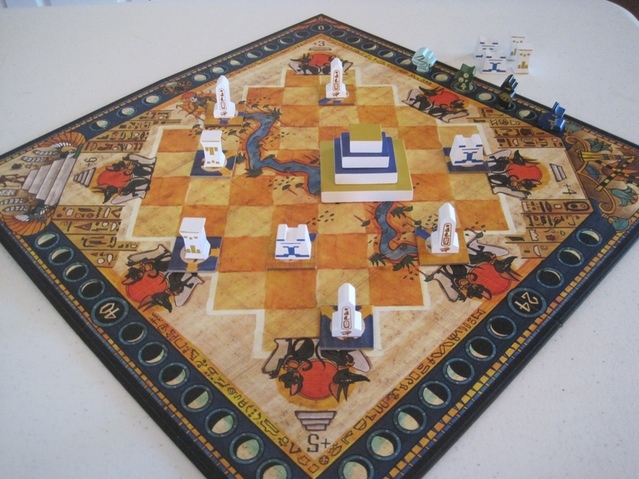 Heir to the Pharaoh is an Egyptian themed abstract game. It plays over two phases that are repeated at set number of times. In the first phase you are bidding for the favour of the gods. Essentially you are having an auction for the actions you can take in the next phase (god cards). In the beginning of the game you have a hand of 10 cards with the numbers 1 to 10. Then you reveal one of the god cards (that have been randomly shuffled). Next, the both of you chose a card to bid with. The highest bidder wins the card and can take that action in the next phase. The trick is that the cards you bid with, are given to your opponent after the auction round. Thus, if you spend all your high cards in one round, you will be left with no high cards in the next round. You therefore want to make sure to use your high bidding cards when the timing is right. And preferably only bid one number higher than your opponent. You should also try to use your low bidding cards when you think your opponent is playing a high card that you probably won’t win anyway. In the next phase, you are using the god cards you just won to manipulate the board state. All the god cards have a number on them, which determine the order they are played in. One card (Seshat) lets you place monuments on the board. You want to make your monument tile point at as many other monuments as possible, while avoiding to place it in a way that lets your opponent achieve any points from pointing a monument at your monuments. The monuments come in various point values. You get the amount of point that the monuments you point at are worth. The exception is that if you point at the pyramid, you will get the amount of points that the monument itself is worth. Another god card (Ra) lets you place a token on the sun track – another way to achieve points at the end of the game – at the end of the game you will get points for the longest amount of rounds you had control of the sun track. So the meat of the game is winning the cards you need most right now – for the lowest price. There are also Animal Magic cards that let you do various effects, and all the god cards have a special effect that you only get when you have the Pharaoh’s favor. There are many cards and rules that you must learn before you can start playing, and indeed, that is one of the games problems. The barrier of entry for a quite simple game – once you have learned it – is too high in my opinion. Another problem is that the game is quite repetitive. Once you have played a round, you have done everything there is in the game to do (or seen it be done). Despite these problems, the game draws me in with its theme and its possibility to out-think my opponent in the auction phase and thus do cool combinations in the actions phase. I’m quite torn on the game. I find it fascinating in its many actions that still result in a simple game. The auction mechanism is brilliant thought out and I hope more two player games copy it. It is that good. On the other hand, I feel that the game lacks an arc that makes it more exciting toward the end than it was in the beginning. But as I mentioned, these problems are not enough for me to not like the game. But sadly, they are stopping me from loving it. A really good game though! What you do in the game is simple. But learning all the simple things you can do takes a while. So the learning curve is a bit steep. Overall it is still a game in the easier end of the difficulty spectrum.